I am blessed (and often aggravated) by being married to a CPA.... my beloved husband is all accountant, Italian and an accountant. Now you may be giggling at my predicament. I'm German and Scottish and a crafter... it's a match that adds to 5 beautiful girls, one strapping boy, one dog, one tortoise and a bearded dragon, 10 koi fish and a ton of crazy fun. 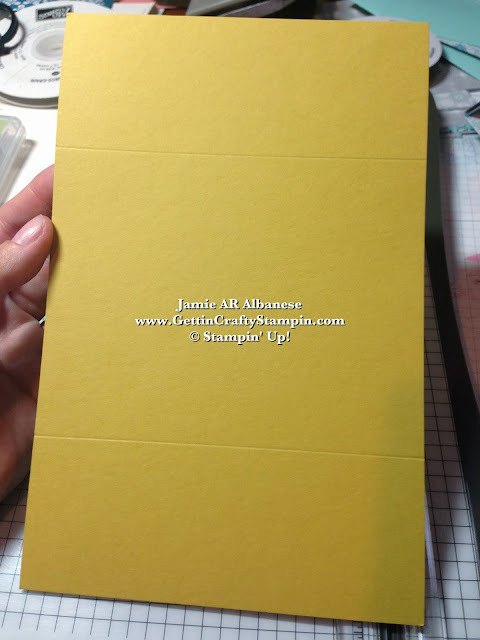 Cut at 5-1/2" the Summer Starfruit card stock. 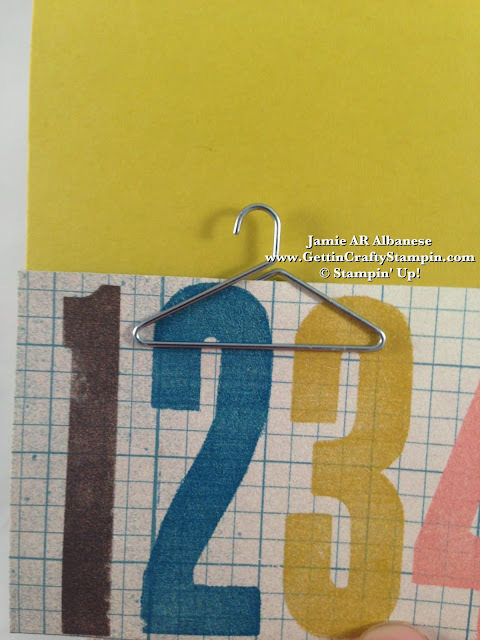 Then using the Stampin' Trimmer, just turn the paper and Score at 2-1/8" on each side. Adhere the Soho Subway Designer Series Paper with the SNAIL Adhesive to the bottom panel. 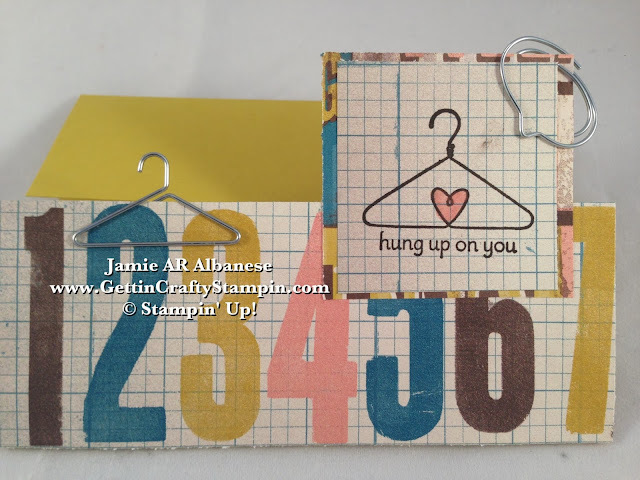 The numbers and graph paper are ideal for the accountant who this card is made for. 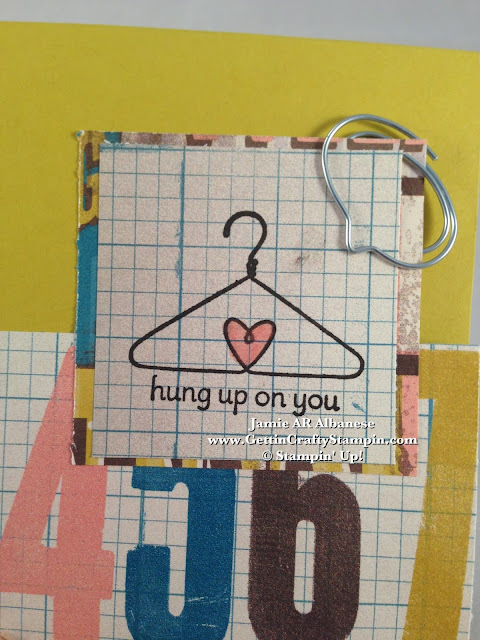 With the Hung Up Cute Clips show what you are trying to say... this cute 'word bubble'. Stamping this Crazy, Mixed Up Love 'hung up on you' sentiment in Early Espresso ink is an ideal way to tie it all together and yet represent his masculine side. Accented with the Crisp Cantaloupe Stampin' Write Marker this cute heart says it all. Layered over the back side of this graph paper, the graphic and masculine image will be ideal for my man. 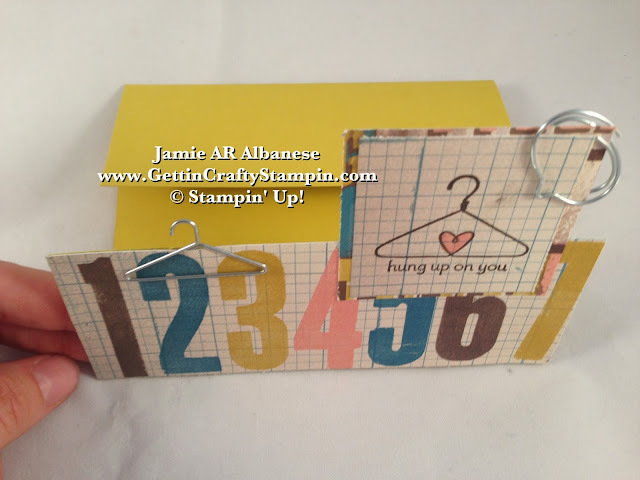 Little Accents like this Hung Up Cute Clips hanger is a fun way to add whimsy. 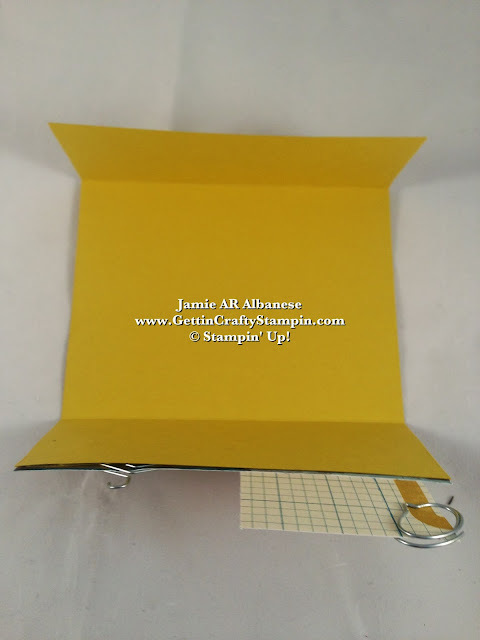 This Tri-Fold card delivers a bigger punch and WOWs while only being a different way to fold. This quick card is ideal as I had to complete it as he was working in the yard - lol... being sneaky is hard in a house filled with nosey people. Tri-fold cards allow you to have a unique delivery and more room to write. I do like standing above the crowd, my hubby thinks I do... (awwww). So I'm far from perfect (shhh - don't tell my kids!!) but this is a pretty awesome family and thanks to the Lord God for bringing us together, my husband made it all possible. I find that I don't say how much I appreciate those around me as often as I should... my poor hubby can often get the last bits of me. What a good man to put up with that... lol. Show that you care! 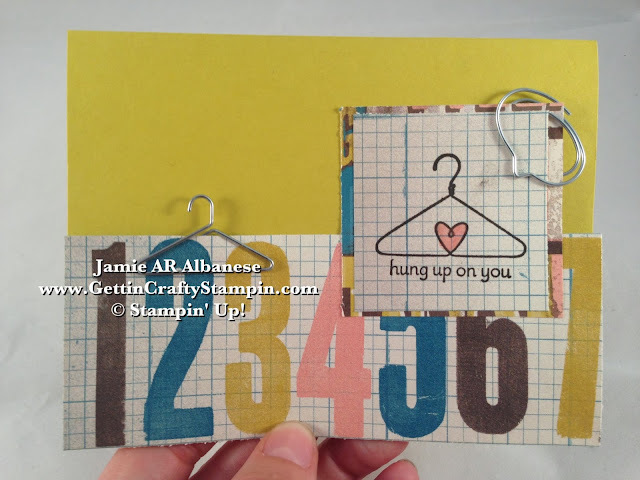 Deliver a quick card (because sometimes that is all you have to create it) that is sure to WOW! Personalize it with our amazing papers and cute accessories... hopefully they will know how much you care! Thanks for coming by, I try to post daily. Bring your friends and family along for the fun! 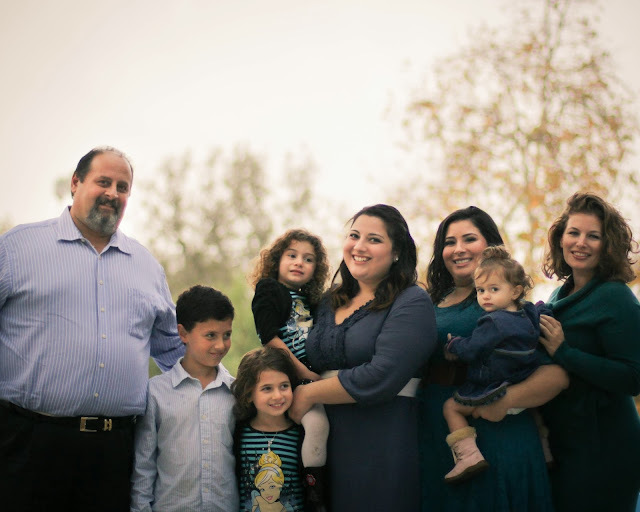 Share and Pin me and support my love of crafting and this wacky and fun family of mine. Being married to an Italian CPA is a fun balance to this Scottish/German crafter. The math is far from simple, sometimes it's like Algebra to me (and as a dyslexic that is really wacky). The equation sums up to a home full of loud love, 6 beautiful children, Potatoes and Pasta, and more animals than this man could possibly want.... so I may not say 'Thank You' or 'I love you' as much as I should... but I try to show him just how special he is to us... thanks for sharing this moment.